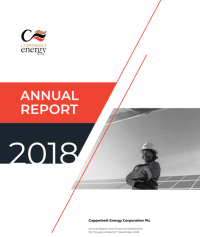 The Directors of Copperbelt Energy Corporation PLC (“CEC”) are pleased to announce the release of the annual report for the year ended 31 December 2016. Below is an extract from the Chairman’s Statement. CEC has produced a compelling set of results in a period where the environment challenged our growth and expansionist agenda. Low commodity prices, constrained power generation in-country, customers cutting back on their power uptake amid a generally precarious macroeconomic environment were all factors that the business contended with in 2016. The year also saw a corporate action whose effect on the structure of the Group going forward is significant. Effective 30th December 2016, CEC Africa was separated from the Company and is now a sister company to CEC Plc rather than its wholly owned subsidiary. At an EGM held on 9th December 2016, you the shareholders, on the proposal of the board, resolved to dividend out CEC Africa as a distribution to the shareholders of CEC. Hence, a dividend in specie of CEC Africa from CEC Plc to its shareholders was made. The effect of that transaction is that both CEC Plc and CEC Africa are now held by the same shareholders. The action was premised on the assumption that shareholders must be allowed to measure the performance of the two entities separate from each other as we now believe they face very different risks, and to enable the shareholders retain any upside that may occur in CEC Africa in future. Despite a 15% slump in domestic power sales, revenue was compensated for by an 86% rise in power trading revenue, coming in at USD355 million, the same level as 2015. EBITDA rose by USD10 million from USD80 million in 2015 to USD90 million. The Company took a decision to impair its investment in CEC Africa of USD100 million to USD1. Also impaired was a receivable, from CEC Africa, of USD51 million. The Company registered a loss of USD112.57 million for the year 2016. The loss was driven solely by the impairment already explained. Moving forward, post-restructuring, revenue and the cost structure will drive the Company’s financial performance.